In 2018, Zaman leadership decided that it was time to turn a new page. 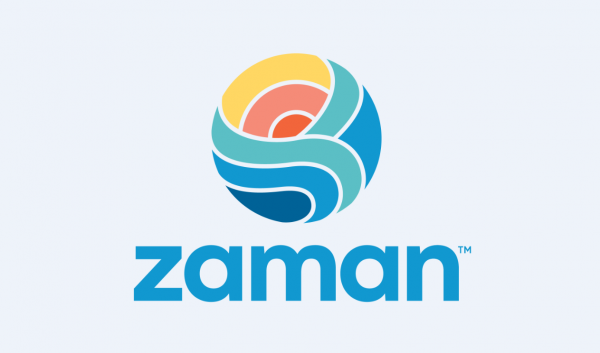 In the 13 years since the original logo was created, Zaman has grown exponentially from a grassroots team to one with global reach. It was time to establish a fresh look that would convey this evolution and Zaman's renewed vision for the future. We are pleased to introduce the new logo and brand for Zaman. Zaman worked closely with Metro Detroit - based branding agency, Zoyes Creative, to pinpoint exactly what the new look should convey about the organization. After an enthusiastic workshop and wonderful input, the team arrived at a refreshed, welcoming, and hopeful new brand. The design aims to elevate Zaman's logo to better reflect the current organization -- one with worldwide reach, longevity, and endless heart. It is bold and iconic with the strength of a global brand. The range of colors reflects the growing number of Zaman's programs and celebrates the diverse backgrounds of the Zaman family. The symbolism is universal without being literal, supporting brand longevity and utility. It welcomes the viewer to connect with it and project onto its meaning. Some see a sunrise, a warm embrace, uplifting wings, a globe, a flower, or a swaddled infant. All of these interpretations are relevant to Zaman, but the emotion it evokes is what makes the logo memorable. It is a symbol to represent Zaman's brightest vision for the future -- Hope for Humanity -- in all its brilliant colors and forms.